The out candidate also said he was disappointed a women didn't win the presidency in 2016, and said he'd likely have a female VP. Presidential candidate Pete Buttigieg told Ellen DeGeneres that Vice President Mike Pence should come out in favor of workplace protections for LGBTQ people. 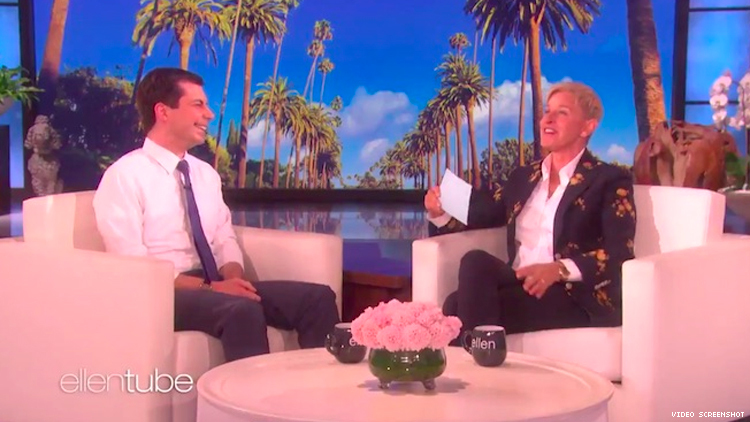 Buttigieg’s latest response to his fellow Hoosier came during an interview for The Ellen DeGeneres Show. DeGeneres released a clip of the show in advance (see below) and will air a longer cut of the interview today. Buttigieg, mayor of South Bend, Ind., served at the same time Pence, as governor of Indiana, signed the controversial Religious Freedom Restoration Act. Now a Democratic candidate for president, Buttigieg slammed Pence this weekend during a speech at the Victory Fund brunch. Pence responded, saying he always had a good working relationship with Buttigieg, and that he considered the out candidate’s recent critiques a politically expedient attack on his religion. But Buttigieg said the words were not an attack on religion at all. Buttigieg indeed speaks frequently of his faith. DeGeneres agreed, noting faith has been used against queer people in the past. Buttigieg said it’s important politicians represent both those with faith and those with none. But he said his own reading of scripture focused on helping people, not discrimination. “When I’m in church, the scripture I hear is about taking care of the least among us,” he said. “It’s about lifting up those who are most vulnerable, about visiting the prisoner, taking care of the sick and welcoming the stranger. DeGeneres raised concerns of some that Buttigieg’s candidacy is problematic to those who want a different type of diversity. Specifically, she mentioned many were disappointed America didn’t elect its first female president in 2016. Buttigieg said he was upset about that too. But if wins the Democratic nomination, he committed to considering a female running mate and promised diversity in his administration. “The next president is going to have to make sure that that administration, at senior levels, has gender balance especially, if the next president turns out to be male,” he said.